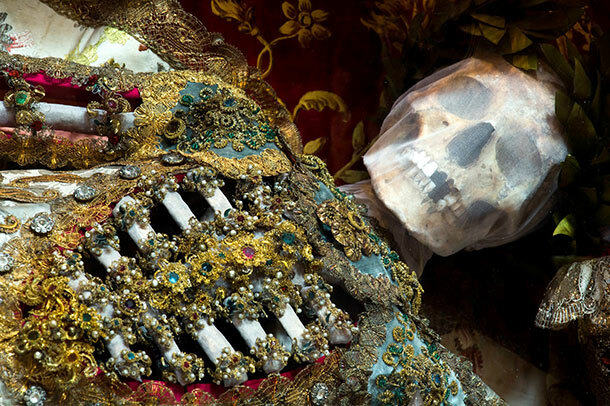 See Here: These are the most beautiful corpses I have ever seen. When you see them you won’t believe your eyes. Thousands of bodies were discovered underneath Rome in 1578. At the time, they were thought to be Chrstian martyrs and they fished them out of their original burial places to lay them back to bed in full glory. 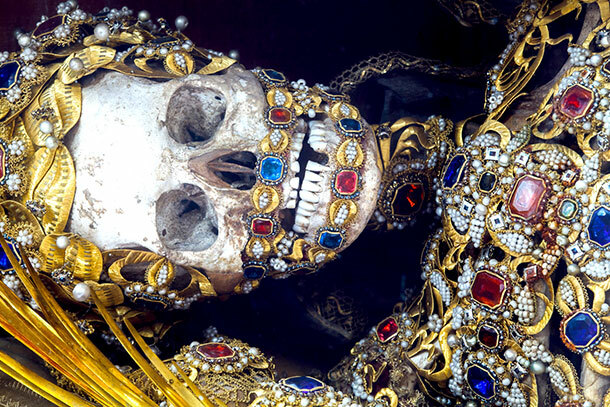 The discovery of these so-called "Catacomb saints" was a perfect coincidence at the time of the Reformation. To strengthen the faith of the believers, something unbelievable happened with the bones! The bones were tediously put together into complete skeletons with meticulous detail work. They were sent all over Europe. They were dressed in the finest of materials, precious stones, and pearls. 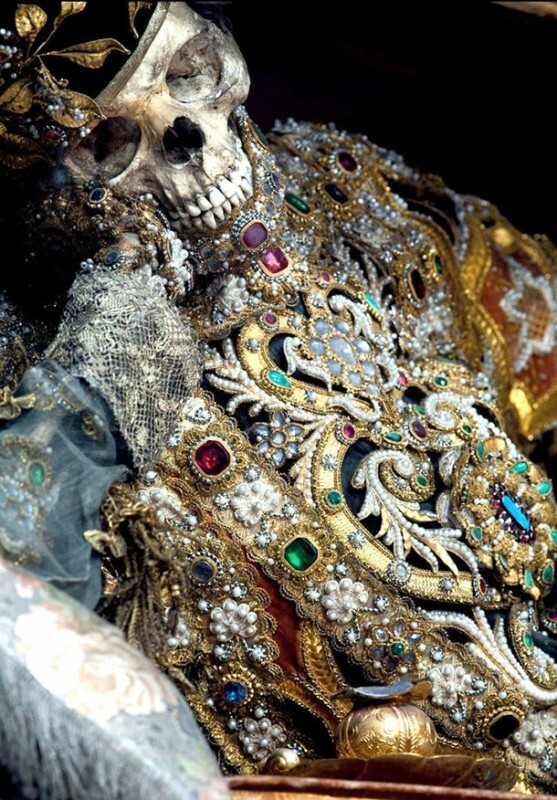 The bodies were adorned with them extravagantly! 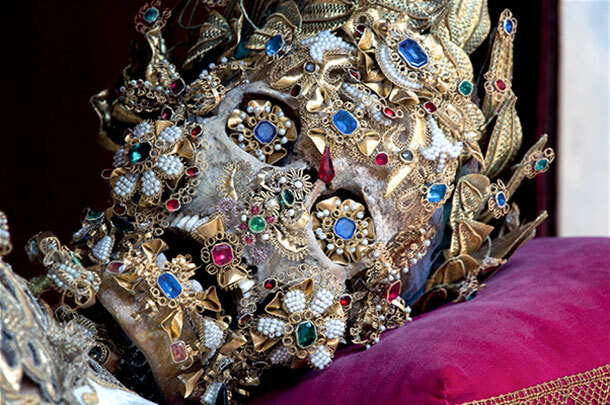 With targeted use of symbolic relics, the skeletons were depicted as various saints. 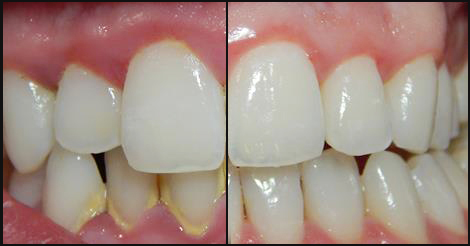 An unbelievable deception! Artists worked skilfully to depict the gigantic wealth awaiting brave Christians in the Afterlife. 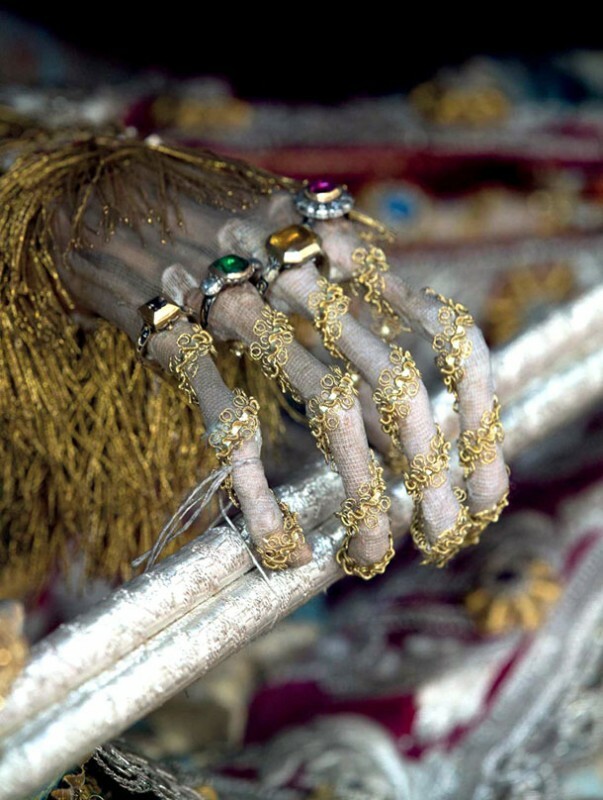 For the dead bodies were decorated to be displayed publicly in churches! 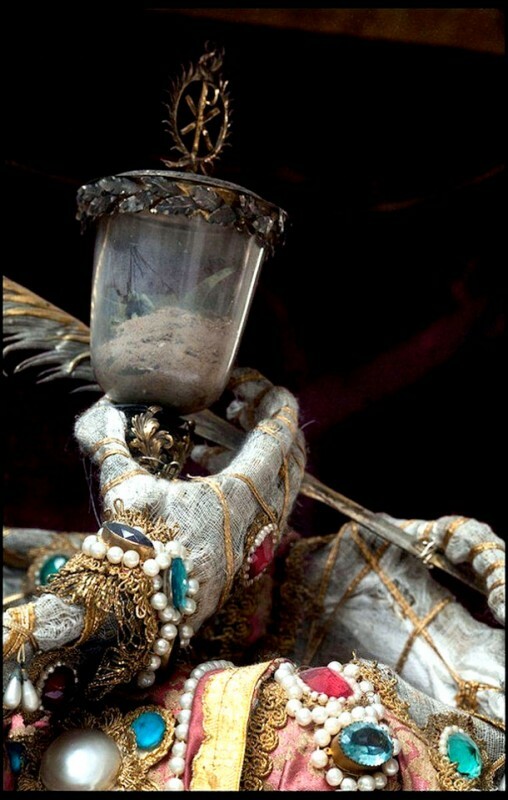 As the actual remains of individual saints, recognizable by their signature relics. For over 200 years people prayed to the bodies as saints! 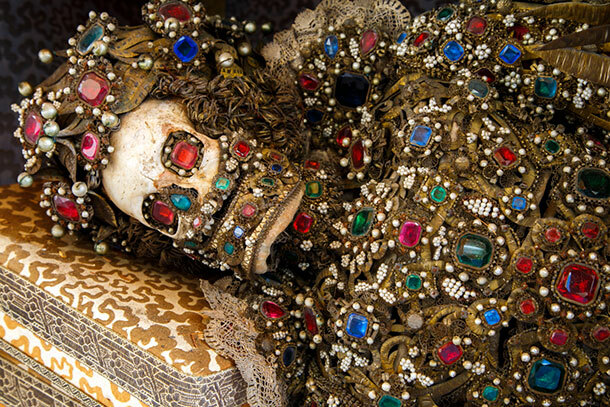 When the scandal was uncovered in the 19th century, many "Catacomb saints" were destroyed. But some could be saved, hidden backrooms, chambers, and attics. They were protected like the treasures they were. The skeletons survived 2 World Wars in their hiding spots. And then they faded into obscurity! When you see the opulent treasure: unbelievable! 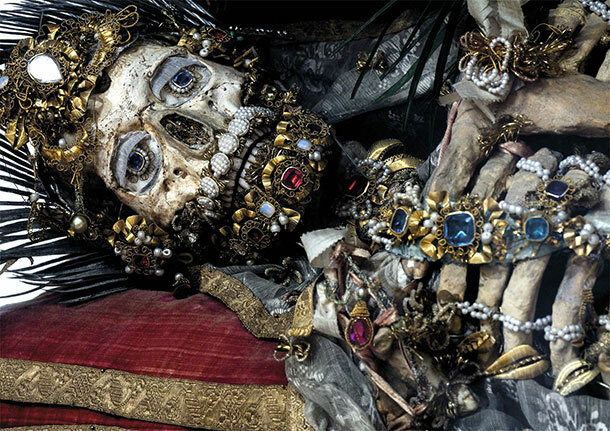 The author and photographer Paul Koudounaris took it on as a mission to find the lost corpses of the so-called saints. 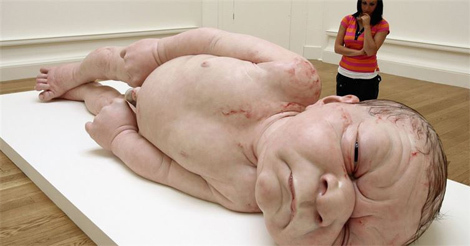 Eventually, they were located in various underground passages and chambers. He was able to find more than 70 skeletons across Europe. Who knows if any ever made it to the US!? 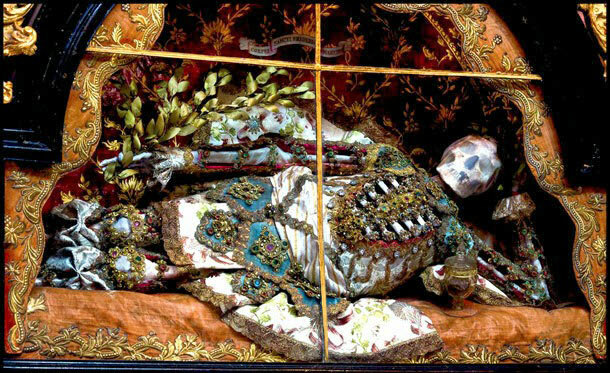 This corpse, with eyes almost grotesquely replaced with gems, is supposed to be the martyr Valerius, found in Weyarn, Germany. These photos invite you on a macabre but fasciating journey through time. Back into a forgotten and almost unimaginable world! These photos give you chills down your spine. When you felt them too, then share these pictures with everyone you know and give them a look into a long-forgotten mythical world!